Regional branches of Zimbabwe’s ruling Zanu-PF party have joined growing calls for President Robert Mugabe to resign. The move comes ahead of a protest march to be held in the capital Harare on Saturday, fully supported by the country’s military which staged a takeover on Wednesday. War veterans until recently loyal to the 93-year-old president and liberal groups have also urged him to quit. Earlier Mr Mugabe made his first public appearance since the takeover. 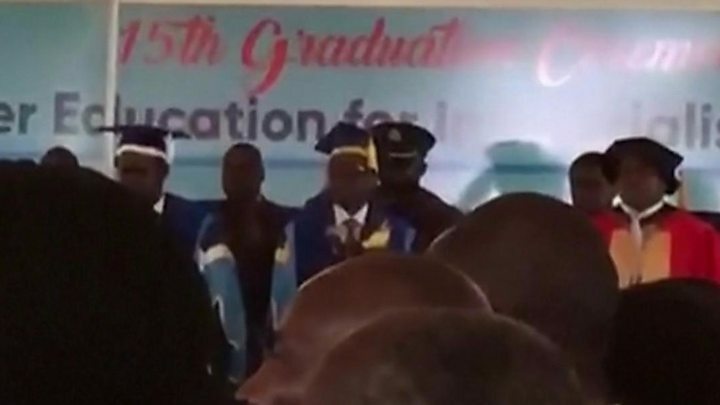 Mr Mugabe had been under house arrest for days, but attended a graduation ceremony on Friday, handing out degrees. The army made its move after a power struggle over his successor. Mr Mugabe sacked Vice-President Emmerson Mnangagwa last week, apparently to pave the way for his wife Grace Mugabe – who is four decades younger than him – to take over the presidency instead. The military said it was “engaging” with Mr Mugabe and would advise the public on the outcome of talks “as soon as possible”. Who is saying Mr Mugabe should quit? At least eight out of 10 regional party branches voted on Friday evening for Mr Mugabe to resign as president and party secretary. In an unprecedented broadcast, several regional leaders appeared on state TV saying that he should quit. They also called for Grace Mugabe to resign from the party, and for Mr Mnangagwa to be reinstated in the party’s central committee. The party’s members agreed to mobilise support for and attend Saturday’s rally. The party is planning to hold a special central committee session over the weekend to discuss the crisis. Meanwhile in a statement issued on Friday evening, the Zimbabwe Defence Forces (ZDF) said it had been approached by organisers of the rally, which it described as a “solidarity march”. Earlier Christopher Mutsvangwa – the leader of the influential war veterans’ association, once loyal to Mr Mugabe – called for a huge turnout at the rally. “We want to restore our pride and tomorrow is the day… we can finish the job which the army started,” he said. Liberal groups opposed to the president have also backed the protest. The leader of last year’s #Thisflag protests, Evans Mwarire, urged people to turn up. 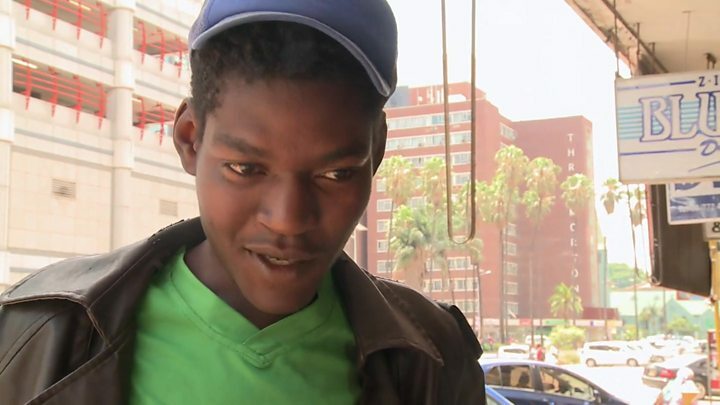 What happened when Mr Mugabe appeared in public? Mr Mugabe’s attendance at the graduation is an annual tradition but he was not expected this year. BBC Online Africa editor Joseph Winter says the president was allowed to be there partly to keep up the pretence that the military have not staged a coup and partly because of a genuine, deeply felt respect for him going back more than 40 years. Mr Mugabe opened the ceremony at Zimbabwe’s Open University, where he is chancellor. Grace Mugabe was not present. It had been thought she had left the country but it emerged on Thursday that she was at home with Mr Mugabe. Robert Mugabe – hero or villain? Soldiers seized the headquarters of Zimbabwe’s national broadcaster ZBC on Wednesday and loud explosions and gunfire were heard. The military was only targeting what he called “criminals” around the president, he said, denying that there had been a coup. What has the reaction been across the world? To get to President Mugabe’s rural home you drive along the Robert Mugabe highway. It’s probably one of the best maintained roads in Zimbabwe, like driving on a carpet. Along the way you are greeted by a plaque erected in his honour. Kutama is a small and tightly connected village where everyone knows each other. The man goes to St Francis Xavier Roman Catholic Church with Mr Mugabe, a devout Christian, whenever he visits. “He never demands special treatment. He visits people to check on their welfare,” said the man at his compound. He said he supports the move by the army saying it’s meant to correct a broken system. “If his term goes out then there’s nothing wrong,” he said.